The late Dr. Marta Sanchez was an accomplished pianist and Professor of Music and former head of the Music Department at Carnegie Mellon. 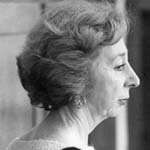 She was a specialist in eurhythmics and piano improvisation and directs the Dalcroze Training Center. An educator and musicologist, she lectured and consulted in the United States and abroad, participated in national and international conferences and was actively involved in musicological research and educational projects.